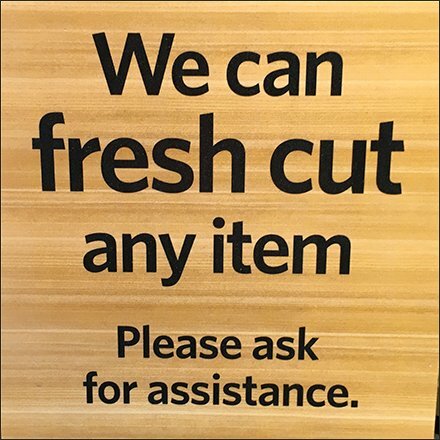 If your fruit salad simply must be the freshest-of-the-feesh, Wegmans® can and will accommodate you with this We Can Fresh Cut Any Item Green Grocer Promise. Even though the whole fruit is fresh, and the cut fruit fresh cut today, you can get it fresh cut this instant. And if that is not enough proof of Green Grocer professionalism, take one of the professional business cads to use to email or call in any fresh fruit or veggie emergency. This We Can Fresh Cut Any Item Green Grocer Promise seen at Wegmans, Allentown PA.